For those of you adventurous enough to make a trek to the Finger Lakes in the winter, you’ll learn it’s the perfect season to get an intimate look inside the operations of one of New York’s prime wine regions – the Finger Lakes Region. During the winter months, you’ll find there are often only a handful of people in the tasting rooms, allowing the sales staff – who are frequently also the winemakers and vineyard owners – to guide visitors through the various vintages. The lack of crowds encourages you to stay awhile and really learn about the area’s wine and the people behind the wineries that create award-winning blends. Cayuga County’s eleven wineries do have varying hours throughout the winter, so always call beforeyou visit so you won’t be disappointed! If you are looking for a little more action and people to hob nob with, winery events do continue throughout the winter. 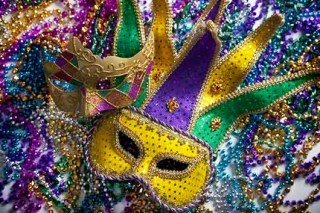 The Cayuga Lake Wine Trail’s Mardi Gras, February 20-21, 2016 includes 16 wineries where you can travel from winery to winery and sample their Mardi Gras – inspired dishes paired with their fine wines. You will also take home a recipe card featuring each dish and Mardi Gras beads, of course, plus be entered in a chance to win a prize at each winery. Start your travels at the family-owned Long Point Winery and King Ferry Winery on the east side of Cayuga Lake, where you’ll have the chance to get up close and personal with the winemakers and owners. It’s an experience not to be missed! In March, the fun continues at the 2nd Annual ‘Bacon on the Lakein,’ March 19-20, 2016 This event features samples of bacon infused dishes, a souvenir wine glass, recipe cards, a chance to win a BBQ themed gift basket and of course amazing Finger Lakes wine tastings. If you love bacon (and who doesn’t? ), this is the event for you! For places to stay and dine while you enjoy your winter wine experience in the Finger Lakes visit www.tourcayuga.com.